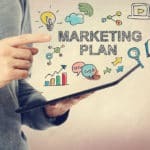 You may ask yourself, ‘why do I need a monthly marketing plan for my real estate company?’, and that is a very good question. While you may have written a marketing plan before you started the real estate business, it is beneficial to update that plan to a monthly development to avoid stagnancy or repetition. Below, you will find the tips and tricks you will need when devising a new real estate monthly marketing plan. You have a lot on your plate: you write your own blogs, manage client newsletters, and take many phone calls. It is easy to get sidetracked when creating your goal. When a new month begins, sit down, distraction-free, and assess your progress, goals, and marketing. A real estate monthly marketing plan will steer you back to your original plan, keeping you face-to-face with your goal. As your month comes to a close, ask yourself, “where did my business come from this month/year?” This question will lead you to investigate the crux of where your leads and visitors came from, what you need to keep for the next month, and what you need to do away with that way you are stuck with the same mundane ideas and plans all the time. Try to keep a notebook of anything that you put into action pertaining to your real estate monthly marketing plan. Write down new ideas and revisit old ones, maybe adding a new twist. Almost every month highlights a day that is important. For example, July 4th is Independence Day, and is most celebrated across the U.S. Use the month of July to focus on a 4th of July theme special event or sale that will attract buyers. Car sales and retailers all over the country use this day to promote a free gift or a product that will entice qualified buyers. Maybe throw in a complimentary gift if they refer a friend during that month. Your real estate marketing monthly plan should always require a catchy theme, relevant colors for your website, and a complimentary gift. Whether I public speaking is your forte or not, get used to it because a successful real estate agent use their mother tongue to bait the catch and reel them in. You don’t have to hold big conventions or intimidating business meeting to be seen. Pencil in a Saturday for a meet and greet at a local winery or a brunch on a Sunday afternoon. When you have the particulars, send an email, talking briefly about your mission for this event. Public speaking events can be a fun way to introduce yourself and your business and is a valuable asset to your monthly marketing plan. For more information how to kick-start a creative real estate monthly marketing plan, the experts at For Sale Marketing can help. We are a trusted and well-round team that specializes in SEO services and copywriting, customer web design, and more. You can contact us here!